Angina pectoris is a symptom of ischemic heart disease that is characterized by paroxysmal and usually recurring substernal or precordial chest pain or discomfort. It’s caused by an imbalance between myocardial oxygen supply and demand and decreased myocardial perfusion. Either can be caused by a primary decrease in coronary blood flow or by a disproportionate increase in myocardial oxygen requirements. Blood flow through the coronary arteries is partially or completely obstructed because of coronary artery spasm, fixed stenosing plaques, disrupted plaques, thrombosis, platelet aggregation, and embolization. Most angina pectoris caused by atherosclerosis, which is the most common cause of coronary artery disease (CAD). However, it may occur in patients with normal coronary arteries. Angina pectoris of recent onset (less than 1 month) that is provoked by minimal exertion. Chronic stable angina showing a crescendo pattern, with chest pain occurring more frequently, with greater severity and duration, with less provocation, and requiring larger doses of nitroglycerine to abort attacks. Prolonged chest pain at rest, clinically indistinguishable from acute MI at the time of presentation. 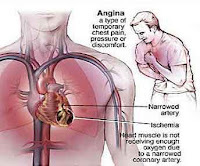 Common Nursing Diagnosis found on nursing care plans for angina pectoris, click here.